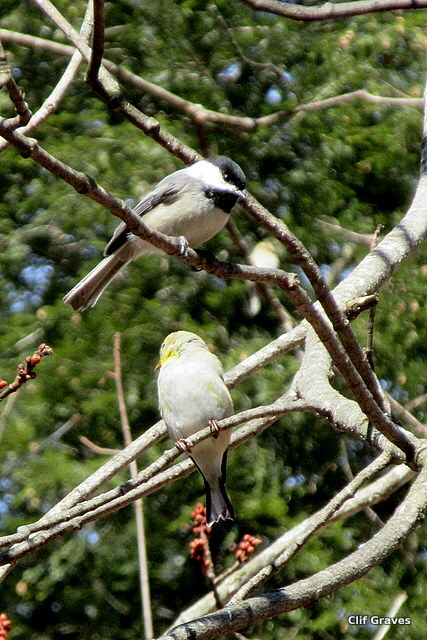 The end of March, and our backyard is positively aflutter with birds. The trees are full of them, and the cheeping of the goldfinches at times reaches a shrill but thrilling crescendo. 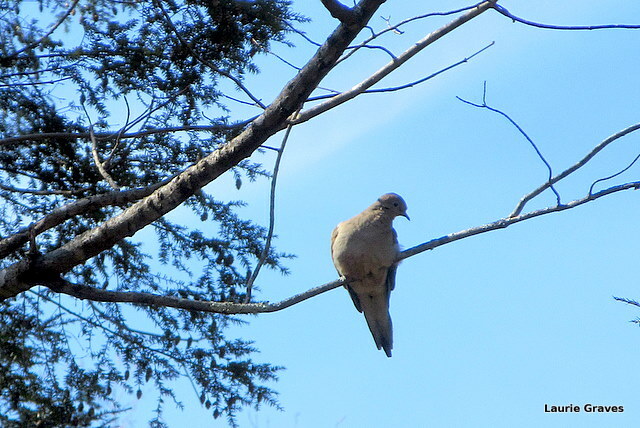 In between, I hear the lovely song of our cardinal; the chipper call of the chickadees, plentiful but never common, as a good friend once noted; the cooing of mourning doves; and many other bird voices. New to the backyard are our cardinal and his mate. To say it is a thrill to have them here is a big, big understatement. Cardinals, recent arrivals in Maine, tend to like open spaces, and the yard at the little house in the big woods is anything but open. However, the cardinals came to us last spring, and they are with us still. I suppose there is less competition from other cardinals here as well as a steady supply of food. Whatever the reason, I hope they (and their descendants) make this their permanent home. Last week, we bought bird seed and filled the feeders. Within a week, the feeders needed to be refilled. The birds are hungry, even hungrier than they were in the winter, when we filled the feeders every few weeks. Perhaps it’s because they are getting ready to start their families, and no doubt this is hungry work. Whatever the case, we dote on the birds and will keep those feeders full. In a month or so, when the weather is warmer, we plan to invite our friends John and Beth over for grilled pizza. They love sitting on the patio and watching the birds as much as we do, and last spring we spent a happy afternoon watching the fluttering beauties who are not in the least bothered by us or our noisy dog. My little camera, which does such a great job with flowers and food, does not capture birds very well. Nevertheless, knowing I am in for heartbreak and disappointment, I try, snapping away at the various birds that come to our backyard. Clif also tries to take pictures of these little creatures that seldom sit still. But once in a while, we even get a couple of pictures that we can actually use in a post. If we lived a little closer, I’d ask you to teach me a little about birds. I love seeing and hearing them, but don’t know a lot so I don’t readily recognize which is which except for the beautiful red of the cardinal. What do you feed the cardinals? Sunflower seeds? Certain kind? Wish you did live closer, even though I’m not exactly a bird expert. More of a bird enthusiast 😉 I just use black-oil sunflower seeds. I’ve tried fancier stuff, but the birds seem to prefer the sunflower seeds. I’ve noticed increased appetites as well – breeding preparations under way! Do you not get bears raiding your feeders? They say bears remember every food source and we get visits in early April every year. We’ve put ours on a pulley up high in the oak tree. We’re hoping to foil the beast this year! Our birds are in a spring frenzy this morning. One of my favorite parts of the day is right after sunrise when they seem to be competing for the loveliest songs. We also have a regular cardinal couple and our goldfinches are starting to put on their summer yellow. They look a little splotchy right now! Brenda, I have a calendar in the kitchen where I make natures, and yesterday I wrote that the male gold finches were beginning to show bright color. And, yes, they do like splotchy. Apt observation! Two male cardinals! Fingers crossed for those bluebirds to join you. All birds at the feeders are great company through the day…….several pairs of cardinals daily. Love it when it is so close to dark and a cardinal visits to get a last snack! Red wings were here before March 1 this year; have had three days with Eastern Bluebirds stopping to check out the houses…………maybe they will stay and nest again! Jim, good luck with those bluebirds! Thanks, Derrick! The little darlings just won’t stay still. We also love to watch the birds in the back garden. Our best month is May, when the Orioles and the Grosbeaks stay for a few weeks. Eliza mentioned the Cornell lab of Ornithology. John found a book that has beautiful pictures and over 200 bird calls that came out of their lab. My toddler granddaughter, Piper, and I love to listen to the bird calls and match them with the pictures. Although she just turned 2, she can identify many of the birds in her back yard by name. Such fun for Piper and her indoor cats who sit by the window and watch. Beth, how nice! I could use a book like that. By the time Piper is five, she will be quite the little birder.